With the A380 vs Challenger 604 incident, there is now growing concern amongst aircrews about the effects of the A380’s wake turbulence. In this incident, reported by the Aviation Herald, a Challenger 604 at FL340 operating from Male-Abu Dhabi passed an A380 opposite direction at FL350, one thousand feet above, about 630nm southeast of Muscat, Oman, over the Arabian Sea. A short time later (1-2 minutes) the aircraft encountered wake turbulence sending the aircraft into an uncontrolled roll, turning the aircraft around at least 3 times (possibly even 5 times), both engines flamed out, the aircraft lost about 10,000 feet until the crew was able to recover the aircraft, restart the engines and divert to Muscat. The aircraft received damage beyond repair due to the G-forces, and was written off. This is a recovery that is in the same category as the ‘Miracle on the Hudson’, and the DHL A-300 recovery in Baghdad. Envision the alternate scenario, which was far more likely: Challenger 604 business jet missing in remote part of the Indian Ocean. Last contact with was a HF radio check with Mumbai. No recent satellite logons. Position uncertain. Search and Rescue attempt called off after 15 days. Nothing found. Probable cause: flew into CB. Thanks to the remarkable job by the crew, we don’t have to guess. We know what happened. And now, there are questions. Back in 1992/3, two back-to-back fatal crashes (a Citation, and a Westwind) were attributed to the unusual wake turbulence pattern of the Boeing 757. In fact, at the time, NOAA said it was the most intense wake they had ever seen. In December 1993, the FAA told controllers to increase the separation, and warn aircraft following a 757 of its presence. This was 10 years after entry into service of the 757, which had its first revenue flight in 1983. Sound familiar? The A380 had its first revenue flight in 2007. We are 10 years down the track, and it’s very tempting to apply the logic that because this degree of incident hasn’t happened before, it’s a one-off. An outlier. That the crew reacted erroneously to a small wake upset at the limit of their flight envelope. This is both unlikely, and, given the potential threat to other crews, a dangerous perspective. The last review of A380 wake turbulence was done in 2006, primarily by Airbus. As a result, a new category was required – “Super“, in addition to the existing Light, Medium, and Heavy, for use by controllers when applying the minimum separation on approach and departure. However, no additional considerations were applied for enroute wake turbulence. Most pointedly, the review concluded that the A380 did not need any wake turbulence separation itself, because of its size. The A380 is the only aircraft in the world to have this “out”. It’s a beast. Even an Antonov 124 or Boeing 747 needs 4nm from the traffic ahead. As Aircrew, use SLOP whenever you can. 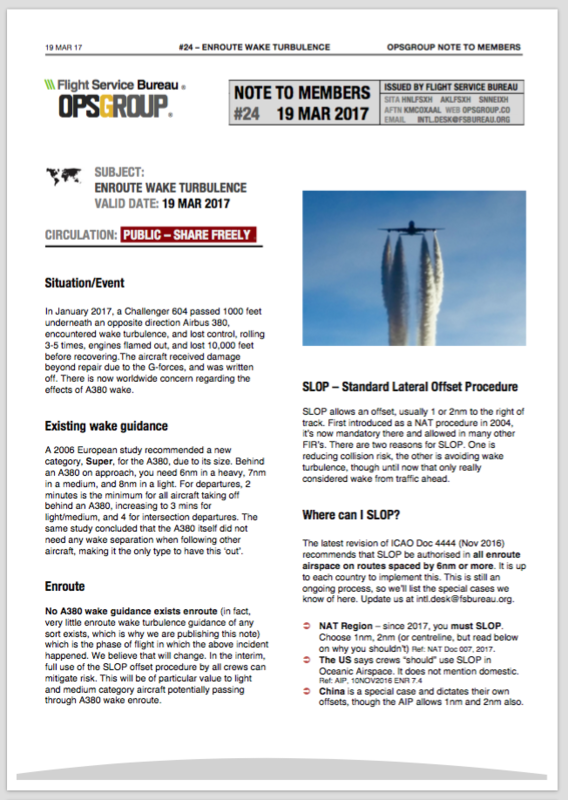 With very recent updates to both NAT Doc 007 and ICAO Doc 4444, the rules for SLOP are a little different than before. Download the OPSGROUP Note to Members #24 – Enroute Wake Turbulence.